Since the Ferguson protests up to the most recent Berkeley riots, a new violent form of radical liberalism has been on the rise. Gone are the very chants and handmade signs, replaced with black clad anarchists assaulting opponents while throwing homemade Molotov cocktails. The FBI says they are still investigating who might have led and organized the riots. 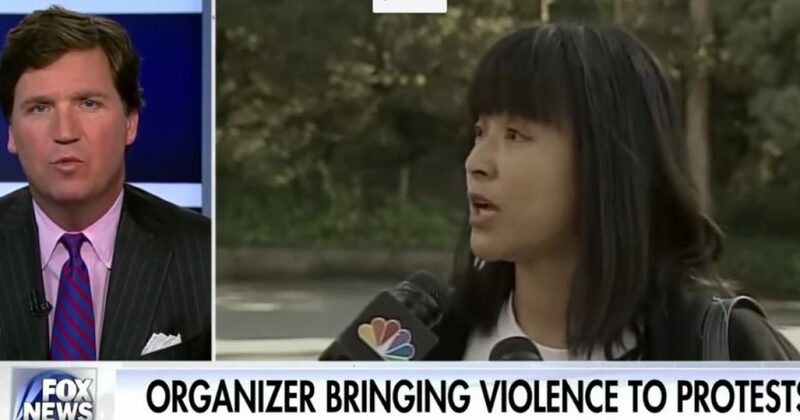 “A fascist is someone who’s organizing a mass movement that’s attacking women, immigrants, black people, other minority groups in a movement of genocide,” Felarca said. She said that Milo Yiannopoulos, the subject of the Berkeley riots, is a fascist because he whips up a “lynch mob mentality” among his supporters and incites violence. Noting that Felarca’s group’s name calls for fighting fascists “by any means necessary,” Tucker pressed her on what level of violence they are willing to use. “To what extent would you go to stop [a] person from spreading ‘genocidal propaganda’?” Tucker asked. Felarca said she would call on others to stand up, counter-protest and “shut down” that person. Is ‘THIS’ What “By Any Means Necessary” Is Advocating? Felarca repeatedly ran into the protester, pulled him down by his backpack while hitting him. Ms. Felarca is a also a middle school ‘Humanities’ teacher in the Berkeley Unified School District. But she is no stranger to controversy. Felarca at one time had been the subject of a petition, by a former student, to have her removed from the district. Felarca said if she is not reinstated, she and her supporters plan to protest again before the school board before their next meeting. “I promise you, you will not get away with this,” Felarca told members of the school board. Proving just how dysfunctional our education system is, Yvette Felarca returned to work at her school on November 2, 2016.